It had been over nine months since my daughter Amanda and I took a bike ride. When she approached me about getting out again, I was game. We decided to revisit one of our favorite rides from last year, the trip from Ventura to Ojai. It starts at the base of CA-33 and ends at Bryant Street in Ojai. The ride is a combination of the Ventura River Trail and Ojai Valley Trail that spans over 30 miles. I’m not going to go into the logistics of the ride since we followed the same route from our first ride, which is documented here if you are interested. The purpose of this post is to compare the ride to our first attempt and to document the ride profile and splits. Overall, the ride was just as we remembered it. Starting from Olive and Main in Ventura, the ride is a gradual incline until you reach Foster Park. At that point, the fun ended, and we started the climb into Ojai. It’s not a terrible climb, but it is moderately challenging. I’m definitely glad that we started in the morning, as it would be a grueling climb in the mid-day heat. 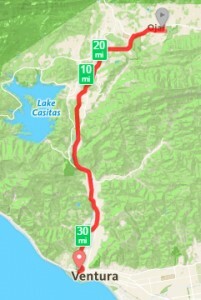 After making the turn in Ojai, the ride down is not nearly as intense. We more or less coasted (rapidly) from Ojai to Foster Park, and then maintained a steady pace into Ventura. Compared to our first ride, we went a few minutes quicker finishing in under 2 hours and 50 minutes with an average speed of just over 11 mph. Our first go around took us 2 hours and 54 minutes with an average speed of about 10.6 mph. For completeness, you can see the mile-by-mile splits for our current ride by clicking here. The splits from our first ride can be found here. I suspect this will be a ride we return to. It’s challenging, but not over the top. It’s also a lot of fun, especially when cruising down the hill from Ojai. This entry was posted in Life Journal and tagged Bike Rides on October 12, 2015 by Gregg Borodaty.